Talkeetna was selected by Budget Travel as one of the 20 coolest small towns in America. It’s no surprise to residents, who affectionately refer to Talkeetna as the town visitors must envision Alaska to be like: a turn-of-the-century gold-mining town with clapboard storefronts, colorful locals and bush pilots strolling the wooden sidewalks with Denali as a backdrop. And if they ever saw an episode of “Northern Exposure,” there’s a good reason outsiders would think of it that way as Talkeetna was their inspiration for the show’s setting. It’s easy to take a trip to Talkeetna from Fairbanks or Anchorage (located 115 miles north of Anchorage and 278 miles south of Fairbanks) and easy to explore once you get there, on foot along the dirt streets you’ll share with mountaineers, travelers, locals and more than a few friendly local dogs who roam free in the streets. 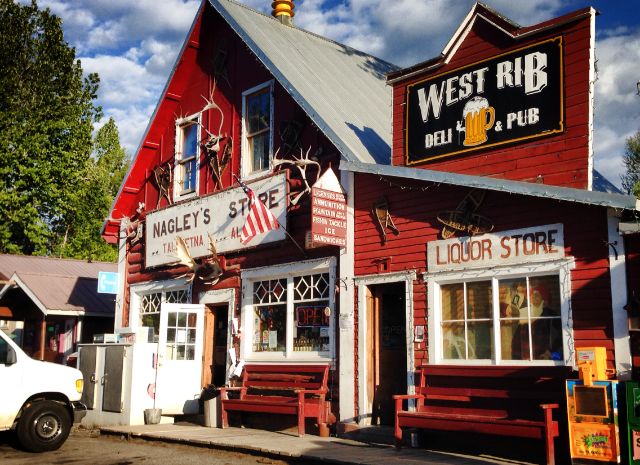 Travel back in time and have breakfast at the Talkeetna Roadhouse, which was built between 1914 and 1917 to host railroad workers when President Woodrow Wilson authorized Talkeetna as the divisional headquarters for the Seward to Fairbanks government railroad route. Better bring your appetite, because it’ll be hard to choose just one course from the giant cinnamon rolls, colossal sourdough hotcakes, eggs and home fries or homemade rhubarb pie (because who says you can’t have pie for breakfast?). Today mountaineers from all over the world flock to Talkeetna to climb Denali or nearby Mount Foraker, the Moose’s Tooth and scores of other challenging peaks, adding an international flavor to the town. You’ll likely encounter climbers (as well as bush pilots and airplane mechanics) lounging around at the new Denali Brewing Company or Mountain High Pizza Pie awaiting flight shuttles up to the glacier base camp. Even better is hopping on one of those planes yourself for a scenic fightseeing tour around Denali. If you’ve never done it, put it at the top of your list. To work off the calories from breakfast, bring along cross-country skis or snowshoes and explore the miles of scenic trails in Talkeetna. There are also dog mushing tours as well as snowmobiling (snowmachining) just a short drive in nearby Trapper Creek. In the evenings, take a walk down the street and watch smoke slowly billow out of the chimneys of log homes, watch the northern lights or just relax by the fire. If you’d prefer a more lively evening, check out the schedule of events at the Sheldon Community Arts Hangar for a play, concert, circus, art show or even a masquerade ball. It’s not too late to vote Talkeetna number one so be sure and cast your vote online here. If you visit Talkeetna in the summer, stay with us at Mt. McKinley Princess Wilderness Lodge, or swing into Talkeetna for the day on your way up to Fairbanks Princess Hotel.